I just learned Bevo won't be at the game at the Cotton Bowl. Tailgating, the last great American neighborhood, the new community social, or the good old-fashioned block party. No matter what you call it, it’s still the greatest party on earth! 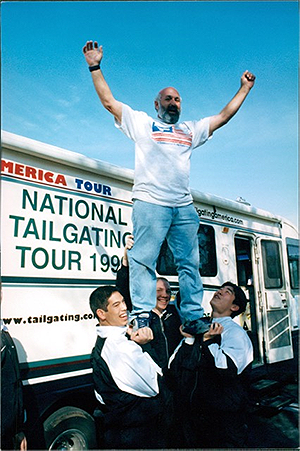 In my 20 years on the road tailgating, and over 1000 tailgates, I find there is always something to learn, always something that you haven’t seen before, when friends meet to share food and fun. Welcome to the 2015 football tailgating season. We have taken our equipment out of storage and made sure it was clean and in working order. Our menus are ready and our group knows where to meet. We are ready after the long off season. So remember the basic rules of tailgating get there early, keep it simple, wear team colors, clean up after, be safe, and have a great time. Be a good neighbor and invite somebody who has never been tailgating to the celebration in the parking lot. Have a great season and save some food for me. "I'll see you down the road" in the meantime pop over to my Schedule page and let me know where I should go next?